Fences are often forgotten when people think about the key elements of a home, when in reality they may be the most important aspect. A fence makes a house a home; it divides your little patch from the rest of the world and creates a barrier that makes you feel as though you have slipped into your little sanctuary. Fences are essentially there to perform as a border, a way to keep things in or out and for that reason they are important. You can’t have a dog without a good fence, your children can’t run around safely in the backyard without a good fence and you can’t stop your neighbour from knocking off your lovingly grown apricots without a good fence. A fence doesn’t have to be all about function. Fences can be a decorative piece, they can add to the visual appeal of your property and therefore add to its market value. You don’t have to settle for the planks of treated pine; there are a huge number of fencing options you can choose from. So, in light of the important functions of your fence you need to put some careful consideration into a few things before you set about building one. Every project needs a vision, a goal that you need to fulfill. When it comes to fencing you need to create a clear picture of what you want the fence to do. If you’re getting a fence to stop your kids or your dog from running out on to the road you’re going to need a different fence than if you’re trying to add a decorative element to your front yard. If you want to add some privacy to your home or block out the light coming from the street you need to design your fence around those requirements. When you sit down and start thinking about what you want you’ll often find that the fence needs to satisfy a number of criteria, which is fine, as long as you know what you’re looking for so you can pass this on to your contractor. Councils love fencing regulations so make sure you do your research about the height and look restrictions as well as where the boundary of your property starts and finishes. There’s nothing worse than building a fence only to be told you have to tear it down and start again because the posts and rails are facing the road or you have obstructed your neighbours property. 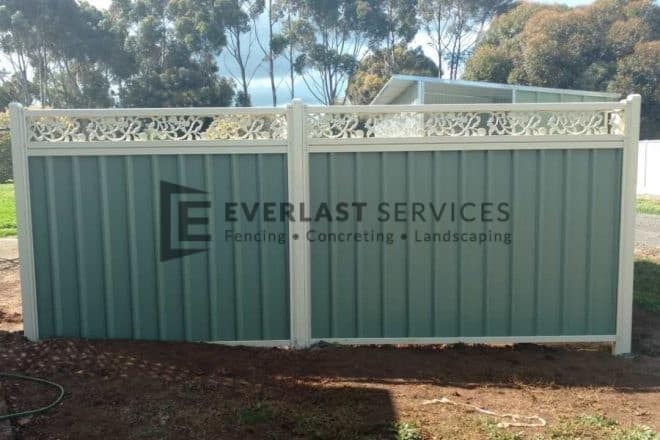 The materials you choose for your fence have a huge say on how much maintenance you will have to out into keeping your fence in good condition. Wooden fences look great but they do require more maintenance than an aluminum slat fence that can be made to look like wood. 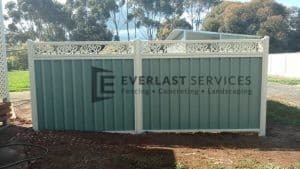 Colorbond is an Aussie favourite but it will cost you more than a steel picket fence. It’s all about choosing the material that suits your vision, your budget and your lifestyle. You may find that you can save some money by using a combination of fencing and landscaping to create a border for your home. For example, you could combine sections of wooden fencing with sections of hedging to create a truly natural and unique look. Alternatively you could save money by using a chain-mesh fence and covering it in a creeper to turn a boring aesthetic into a vertical garden. If you’re planning a fence that borders with your neighbours property you need to involve them in the process. By involving them you can ensure that you don’t incur on their property, block their view or ruin the aesthetic of their house. You may be tempted you just go about your business but this can lead to ongoing disputes and an appearance on A Current Affair. Most of the time you’ll find that you can come to an agreement and even share the cost of getting the fence built. When choosing materials you need to make your choice in accordance with the weather. If you live in an area that is subject to high rainfall you need to choose material that wont rot or rust and you also need to make sure the posts go deep enough to ensure they wont come out if the soil is washed away. You don’t want to build a fence that doesn’t have easy access. Ideally there will be two points of access to every fenced area. You need to ensure that entry points allow you to bring things in and out of the fenced area, like wheelie bins, lawn mowers or cars depending on where the fence is built. It’s important to give back to the local community and economy by going with a local contractor and choosing locally sourced products and materials. Making this choice helps everyone in the long run. It’s important to pay attention to the aesthetics of your street. It can be quite jarring if there’s a loud front fence in a street of toned down facades. Blaze your own trail but pay respect to the general feel of your surrounds – it will help you when sale day rolls around. Fences may not look like complex structures but building one can be quite tricky. You have to deal with slopes, spacing and try and get every section of the fence to match up. Hiring a professional is a great investment because you know the fence will last and they’ll be able to pass on all the secrets to maintaining your fence that you can’t find anywhere else.